There is an extensive public discussion in the (beach) volleyball scene about the differences between indoor and beach volleyball. Most of the aspects discussed are dealing with rules, number of players, court size, scoring, side switch and material as well as air pressure of (beach) volleyballs. Interestingly enough, the question of how these differences affect the individual player switching between indoor and beach volleyball, seems to have been neglected. This is even more strange considering the fact that also in the professional arena there are only few players that made the transition from indoor to beach volleyball successfully. Amongst them are Canadian Sarah Pavan and Dutchman Maarten van Garderen that both excelled at this year’s Beach Volleyball World Championships in Vienna. Therefore, in order to explain their success and provide some strategies to model it, we would like to shed some light on how to best transition from indoor volleyball to beach volleyball. Playing in the sand is very demanding and in order to get accustomed to sand it is key to do some serious training in the sand. Jogging and especially sprinting in the sand can do a lot of good since beach volleyball requires short and intense movements in the sand. Developing “sand legs” allows movements in the sand to become natural and effortless. Since the sand surface is unstable, developing a solid base of core muscles is key in beach volleyball. Core muscles include abdominal, back and hip muscles to support the spine and keep the body balanced. In order to build core strength, dedicated weight-training sessions should be included in the preparation phase. Besides the fact that beach volleyball is played in the sand, it is also only 2 people having to cover the whole court. This increases the required level of cardiovascular fitness significantly. It is absolutely essential for players to get into condition. At the same time training drills have to work on quick reactions and the skill to change directions with the a minimum amount of energy. Therefore, players lacking certain skills, should quickly improve their technique and become multidimensional. Regarding specific techniques, major differences between indoor and beach volleyball refer to serving, setting, hitting and timing when blocking. There is a huge difference in serving when going to the beach. Since you are outdoor, wind is an important factor and you need to adjust your serve accordingly in order to benefit the most. One potential serve to do so is the float serve. A float serve with little spin is usually very much subject to wind. In many circumstances, the float serve used to be performed with a running start. More recently, many players perform standing jump floaters. These are usually even harder to predict and to receive which can put the defending side’s system at stake. In beach volleyball, setting does involve more than only wrist and arm. In order to put enough force on the ball, setting requires players to use their legs as well. Since there are only 2 players, the set in beach volleyball has to be even more precise and coordinated than indoors. When hitting in indoor volleyball, players usually jump forward in order to create more momentum. Due to the sand, beach volleyball players rather need to go into an upward movement to gain height in their jump. To do so, beach volleyball players need to adjust their approach and increase upward power thorugh their knees and legs. This requires well-trained muscular legs that allow to drive the ball over the net with great dynamics. Not only hitting but in general jumping requires a different timing since the sand makes approaches slower. This is also true for blocking. Due to the sand, there is a delay in blocking on the beach that has to be accounted for. Coming from indoor, most blockers jump too early at the beach. Moreover, in beach volleyball you only need to focus on one opponent when blocking, compared to two or even three attackers indoor. There are some very important teaming and psychological aspects to consider when it comes to moving to beach volleyball. 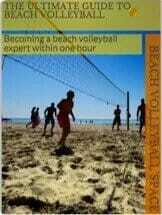 With only two players on the beach, each player’s roles and responsibilities increase. Getting used to move the game to the middle of the court instead of the indoor “setter’s zone” requires a lot of practice. Advanced players have learned to pass more in regard to the other team’s defense, but for beginners passing to the middle is a good start. An additional aspect to train and adjust to is that the player who received the ball is required to come to the setter instead of calling a set. On top of these accountability issues, there is some important relationship psychology coming into play. In a team of six players (or more including spares), individual personal conflicts do not represent a major threat to a team per se. In a beach volleyball team of only two, eroding trust and dysfunctional relationship will usually undermine team success and result in failure. Especially professional teams spend a lot of time together travelling the country or continent in a marriage-like partnership. You better make sure that you and your partner get along well. There are also a few external conditions like sun and wind that have to be taken into account. Since beach volleyball is often played in plain sun, you wanna make sure to apply enough sun screen and drink lots of water. Besides water consumption, it is vital to have a balanced nutrition plan that compensates for the calories expended. To further protect yourself from the sun, you want to wear sunglasses with ultra-violet (UV) protection and optionally even a hat. Sunglasses should have a UV coating and preferably polarized lenses to improve your vision on the beach. Wind is another factor that comes into play when moving to the beach. We already mentioned wind when discussing serving. Besides the serve, windy conditions also impact setting and hitting. When there is significant wind, you might want to reduce the height of your sets to lower the effect of the wind. Additionally, snapping your wrist over the top of the ball when hitting generates topspin which enables the attacker to better control the direction of the ball. Therefore, despite these great examples of success, in general you are better off starting with rather moderate expectations. This will reduce pressure and increase fun when getting ready for the beach! I absolutely love volleyball in all forms, especially on the beach where one can perform those spectacular dives without as much pain. I agree with you that the transition period is definitely there. The movement is so different on the sand and one cannot get the same elevation when jumping. Good article. Great to have your feedback, Gregory! I am glad you can relate to the article since you have done both and can compare. What a great and thorough post! You really cover all the differences between indoor and beach volleyball. Loved it. I have played a little of both and its such fun. In fact on Fridays we go down the beach at Coolangatta and play for an hour after work. I can really relate to the different muscles being used. Thanks for your great feedback, Kev! You obviously know the muscles we are talking about ???? Reid Priddy also switched from indoor to beach and is back on the AVP tour in the US. Just another example of players that have made the switch. Absolutely. He is a world-class indoor player and now he is aiming at Tokyo 2020 in beach volleyball. Great project!